I remember growing up and watching cricket on TV with my father. It was these initials foundations that made me develop the love that I have for the game. As I watched I would try to mimic the performances of Hansie Cronje, Jonty Rhodes and Alan Donald in my own back garden, causing enough grass stains to cause washing issues for days. These were my idols and heroes and even just the opportunity to meet them left me in a state of nervous anxiety, let alone the thought of ever gracing a field with these heroes. Never in my life did I imagine I would socialise with some of my cricketing heroes and never in my life did I imagine playing on a field with them, but the Momentum Cricket Sixes made that dream a reality. The event kick started on Friday with a round of golf where I was teamed up with HD Ackerman, Alan Dawson and OG Molefe (ETV News). HD is probably the finest commentator / host on sports television right now and was a player who should have played more test cricket for South Africa in his career, he also had outstanding leadership ability that would have been useful in replacing Hansie Cronje. Alan Dawson is of course the man who will be best remembered for his match saving partnership with Nicky Boje that took South Africa to the Commonwealth Games final, where they later won gold. Both these men have tackled the worlds best, but both were approachable, fun and great company for a nervous sports blogger! At the launch event I sat next to Wits Universities Gavin Hunt and along with HD we solved the world’s football problems and diagnosed the transfer window with the certainty that only Gavin could really have. 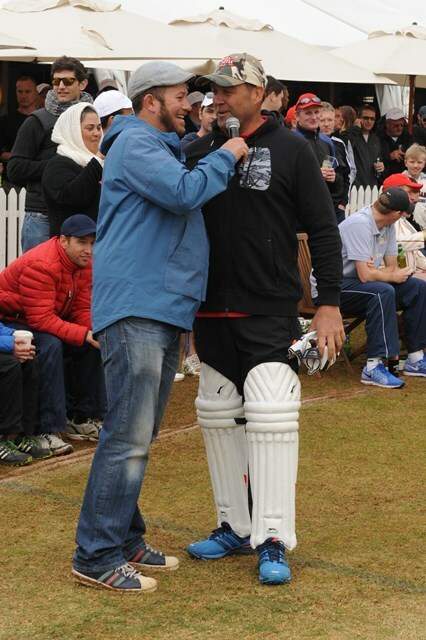 It was also the time when the corporate teams bid for a legend to join their team for the cricket on Saturday. Up for grabs were the likes of Damien Martyn, Kevin Pietersen, Jacques Kallis, Paul Harris, Robin Peterson and a few more. 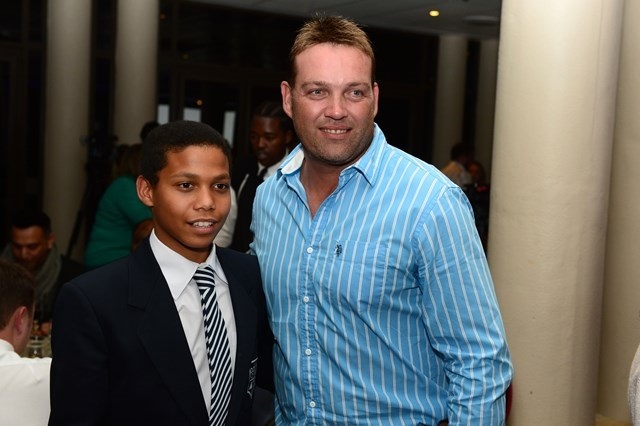 As part of the media team I was placed in the Castle Lager Boucher Legacy side, where we quickly snapped up Pat Symcox and Jacques Kallis as our two legends. I would be sharing a field with Jacques Henry Kallis. We also heard from Jared Southgate, who would play on Saturday with outstanding class, as one of the beneficiaries of the charity behind the event. The young man spoke with the confidence of Barrack Obama. To top off the evening, I was given my Momentum Friendship Blazer, a blazer which represents the values of integrity, friendship, fellowship, inclusivity and unity. The blazer cannot be bought. You cannot ask for it. You have to be nominated by a former recipient. This is something which money can literally not buy. I love it. So Saturday morning with about as much sleep as a kid the night before christmas I awoke to a thunderous storm and my heart was rather heavy. But somehow the weather started to clear and eventually cricket was back on the table. Although the day would be curtailed and shortened, there would still be cricket and my dream would become a reality. And so in our opening game, I strolled to the middle to open the batting with Pat Symcox. Someone pinch me. The results on the day didn’t matter, I scored 10 runs off 8 balls (pretty poor strike rate for a sixes match), but did manage one big six before being run out by Butch James. I faced Paul Harris bowling and was replaced at the crease by Jacques Kallis. You really cant make this up. Graeme Smith, one of the founders, didn’t play on the day as he was running around, but I have to give the man massive credit. Although not always on the endearing side of public sentiment, Graeme takes time for each and every person present and went out of his way to make you feel welcome. The other sports stars on display were truly outstanding with the way they interacted, posed for photos and chatted with the public. 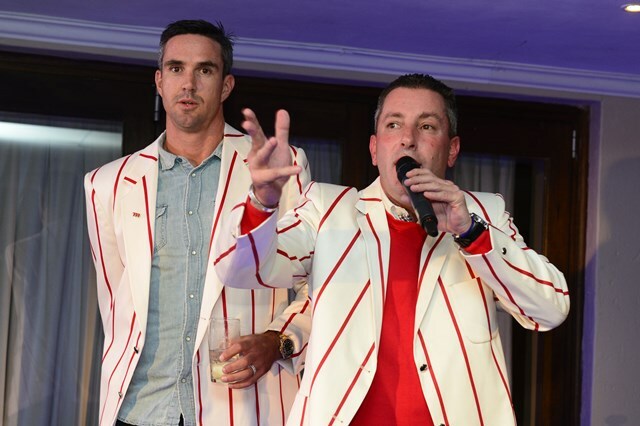 Kevin Pietersen should also be signalled out for his outstanding contribution of playing with the kids for long afterwards. The night ended with some outstanding celebration with Ard Matthews and Prime Circle, hooligans in their own right but also rock royalty in South Africa. It was an experience I will never forget and one of the finest additions to the South African sporting and social calendar. Thank you to Momentum, to Graeme Smith, Justin Kemp and Mark Boucher and also to Kirsti and the team at KL PR and events! I can’t wait for next year!